On Oct. 7, 2010, NASA's Solar Dynamics Observatory, or SDO, observed its first lunar transit when the new moon passed directly between the spacecraft (in its geosynchronous orbit) and the sun. 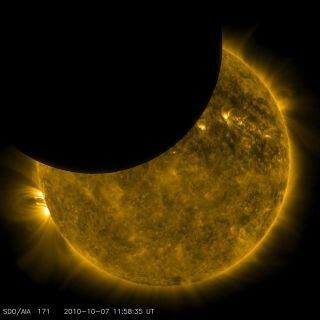 With SDO watching the sun in a wavelength of extreme ultraviolet light, the dark moon created a partial eclipse of the sun. Aspacecraft gazing at the sun has caught some stunningviews of the moon eclipsing the sun as seen from space. Thiswas not a natural partial solareclipselike those that can be seen from Earth when the moonpasses directly between the Earth and the sun. Rather, the eclipse wasonlyvisible from the vantage point of the SolarDynamics Observatory,or SDO, which is currently in orbit aboveEarth. "Thevery sharp edge of the lunar limb allows us tomeasure the in-orbit characteristics of the telescope ? lightdiffraction onoptics and filter support grids," said SDO science team member KarelSchrijver, of Lockheed-Martin's Solar and Astrophysics Lab. "Once theseare characterized, we can use that information to correct our data forinstrumental effects and sharpen up the images to even more detail." Inthe new photos, the rough terrain of the moon can clearlybe seen in silhouette against the bright backdrop of the sun.The sunappears as it would in the ultraviolet range of the light spectrum. NASAlaunched the sun-watching observatory in February onafive-year mission to continually watch the sun. It is the first missiontolaunch under NASA's Living With a Star program. The$850 million spacecraft is equipped with threecameras to monitor the sun and take high-definition photosof our nearest star.